Snow on the west side of the Ranchos de Taos St. Francis Church is in the photograph above–although I am sure everyone recognizes the church. It snowed about five inches this morning. Junipers and piñon hold snow. The sun will come out and warm us. So beautiful, Jack. I especially like the luminarias atop the church, but the snow would be decoration enough. Merry Christmas to you, and every good wish for the coming year! Beautiful Jack! Thanks for this reminder of one of my favorite Christmas spots. Glad you are there. Though I have been away from my blog since 13′, your voice and images remain some of my most favorite reads. Recently retired, moved etc, and hope to get back to the blog again when the time is right. More images out there to chase. Happy, Happy Christmas Jack to you and yours! 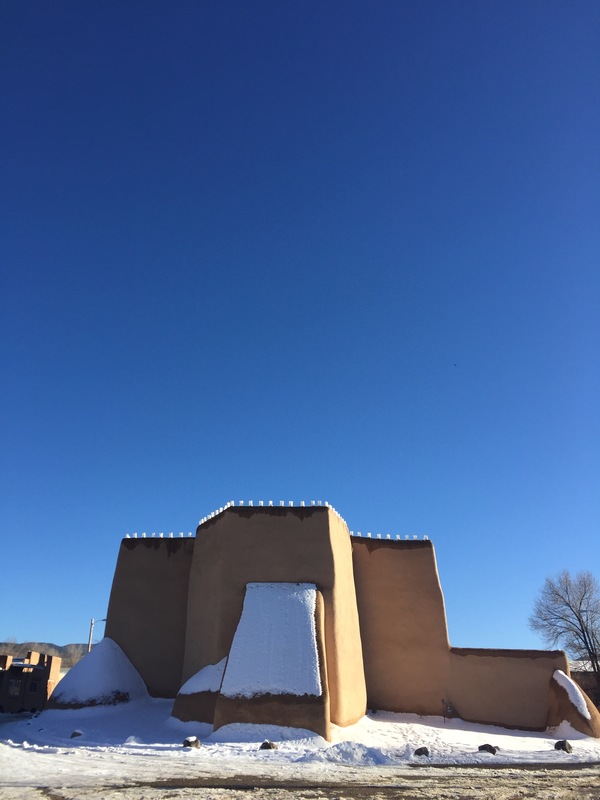 As iconic as those adobe walls draped with farolitos and snow, is that stunning clarity of blue sky. Beautiful image, Jack. Merry Christmas. Yes. I framed it so the sky also prevailed. No photoshop. Strictly iPhone camera. Merry Christmas, Jack. Great photograph.